Artix is one of those setters who, we know, is going to give us a tough challenge. This is true whether setting under his own name, or as part of a consortium. His last Listener was based on British Dames, and I must admit that it seems longer ago than a year. Here we had nine clues in each of the acrosses and downs which were too long for their entry space and would need a letter to be removed and the remainder treated thematically. 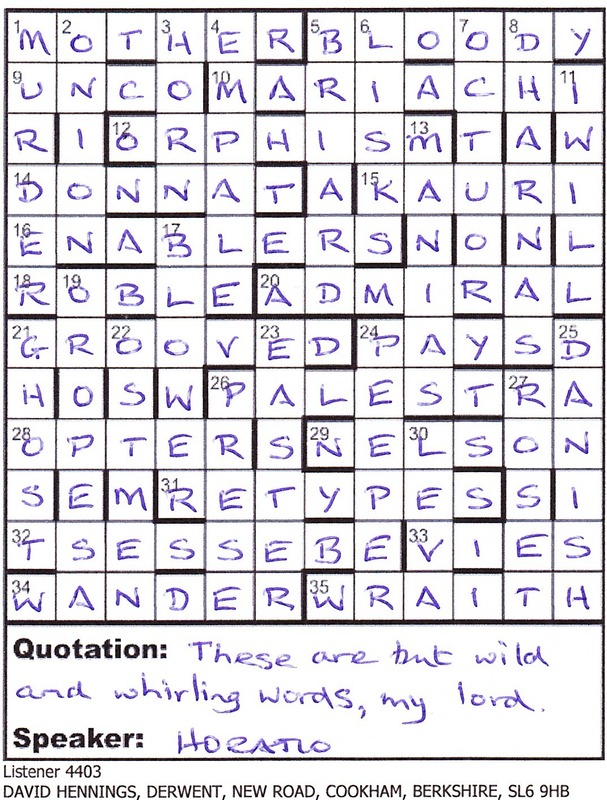 Nine other clues contained definitions of the resulting words, to be removed before solving. This left two clues across and two down which had an extra word, and these words and the associated entries would help us identify the source. There was also space under the grid for more than we’ve ever had to write there before: a quotation (nine words) and its speaker. Two thoughts crossed my mind: could the hidden definitions be more than one word, and was the thematic treatment as simple (!) as jumbles/anagrams? Only time would tell. I also decided that I would use Mrs B from the start rather than after some of the initial solving had ground to a halt. Artix was too tricky a cluesmith! 12ac Might they offer mentorship in transcription, excluding New Testament? (7) was the first clue I solved, being an anagram of ME[nt]ORSHIP, and looking up teacher in Mrs B gave me SOPHIST and, checking for a similar word in Chambers, my eye landed on sopherim, Jewish scribes. This needed to lose a letter before thematic modification, but there was no way I could see which one at this stage. Next came 16ac Qualifiers take Murray’s fearsome baseline smashes, knocking one out (8) ENABLERS, with Murray’s fearsome being superfluous to the clue and thus defining a word elsewhere. [This would prove to be UNCO at 9ac.] Next came 26 where L + SEPARATE* was revealed as LAPSE RATE by a friendly anagrammer. That was the limit of my across success, and the downs weren’t much more help with I WILL, AMNESIA, OROPESA and STEAMER with the second and fourth needing thematic treatment. Seven or eight clues later (five words that spanned about 50 minutes real time), I solved 32ac SEBESTENS and 34ac WANDER in quickish succession. The later had African antelope that would define another entry. Mrs B has nine lines for types of antelope, and near the end, TSESSEBE was a giveaway for SEBESTENS + N. So anagramming was the thematic treatment. It was a relief that we weren’t dealing with meaningless jumbles. Some time later, 10ac had rivals as a superfluous word, and I thought that Sheridan’s The Rivals might be the theme, but the superfluous act in 20ac and one soon accounted for the two words that would help pinpoint the source of “the relevant source”. At this point my money was on Shakespeare, and a scan of the down clues gave a possible Scene five but there was no way I was going to read all the Act I Scene 5s of all his plays, educational though that may be. Hor. These are but wild and whirling words, my lord. Hor. There’s no offence, my lord. And that explained the title. The grid was finally finished, and the extra words discarded before anagramming the remainder spelt out REAARERNG across, and TEEPERMIR. I didn’t need any friendly help to spot Rearrange perimeter. I crossed out the letters of the perimeter as identified by the quotation and was left with Horatio himself. Read those words out to anyone who knows anything about Shakespeare and they would be able to identify Hamlet as the play. Phenominal! Thanks for a great treat, Artix. This entry was posted on 8 July 2016 at 9:00 pm	and is filed under Solving Blogs. You can follow any responses to this entry through the RSS 2.0 feed. You can leave a response, or trackback from your own site.